Cincinnati Bengals rookie running back Jeremy Hill runs for 41 yards into Colts territory. 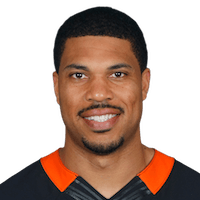 Published: Aug. 7, 2014 at 11:31 p.m.
Cincinnati Bengals quarterback Jason Campbell finds wide receiver Brandon Tate for the 19-yard touchdown. Published: Nov. 18, 2013 at 05:33 a.m.
(11:55) (Shotgun) J.Campbell pass incomplete short right to J.Gordon (T.Newman) [M.Johnson].